More breathable, Quick Dry, and Elastic. Pro-Underwear, Suitable for Long and Short Riding, Night Riding, Mild Cross Country, and Short Distance Racing Cycling, as well as Other Leisure Outdoor Activities. Design & Cut, Seamless Cut to Reduce the Body Rubing, More Comfortable and Fitness. Mesh Fabric, Light Weight, High Elastic Breathable Mesh Fabric Keep Cooling and Dry. 2) The color might be slightly different from the real one due to lights or different seetings of your viewing screen, if you have any question about our items, please do contact our customer service personnel. If you want more products, please visit our store page or contact with us. We will process and ship out the order within 36 hrs after the payment confirmed. 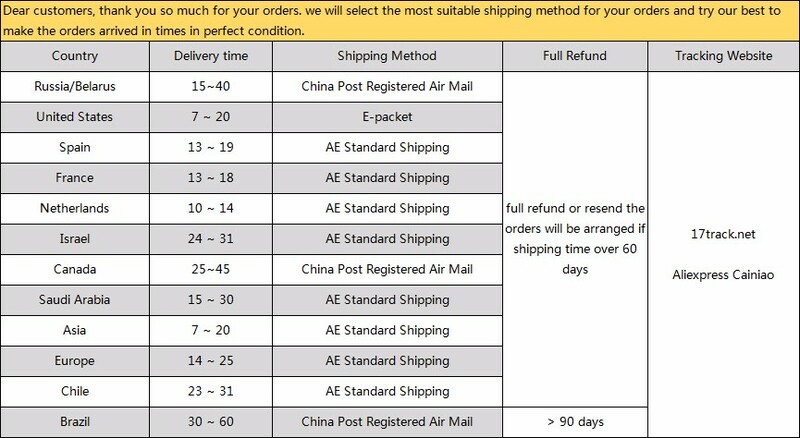 We offered free shipping method as China Post Registered Air Mail & Aliexpress Standard Shipping for most orders. The delivery time will be shorter if you could provides an available & clear address of consignee. The data below is provided by Aliexpress official on March,2018, which is definitely trustable. QC team will check every products to make sure that it is in great condition before shipping. Products will be packed in strong protective material by our trained warehouse keepers. Refund or resend if the product came in defective because of the unexpected transit. Received defective products,and buyers uploaded the pictures within 7 days after receiving the products. Received wrong products, buyers get the products which is not exactly as ordered. Orders doesn’t arrived within estimate delivery,buyers can ask for refund. Easy return. We will offer our return address when we get your return request. we will refund to you once we get. We are good at doing dropshipping and wholesale. If you are interested, we believe that we could be your trusted partner.